We hope that everyone enjoyed the race on Sunday. What perfect weather we had too. Well done to Helen Davies from Ipswich Jaffa, who smashed her own female course record by over three minutes! Well done also to Ramadan Osman who was first man home, only 47 seconds off the Male course record. Let’s do it all again next year! Flat, fast course – View the route on Garmin Connect. The course will begin to be dismantled 3 hours after the start of the race. Course directions will still be available and a ‘sweep’ cyclist will follow the last runner. The race starts near to Great Bentley Village Hall, CO7 8LD. Please note there is no participant parking at the Village Hall. However, there is ample parking on the Village Green, which will be clearly signposted and marshalled. All race numbers and timing chips are to be collected on the day between 09:00 -10:00 from the Village Hall. 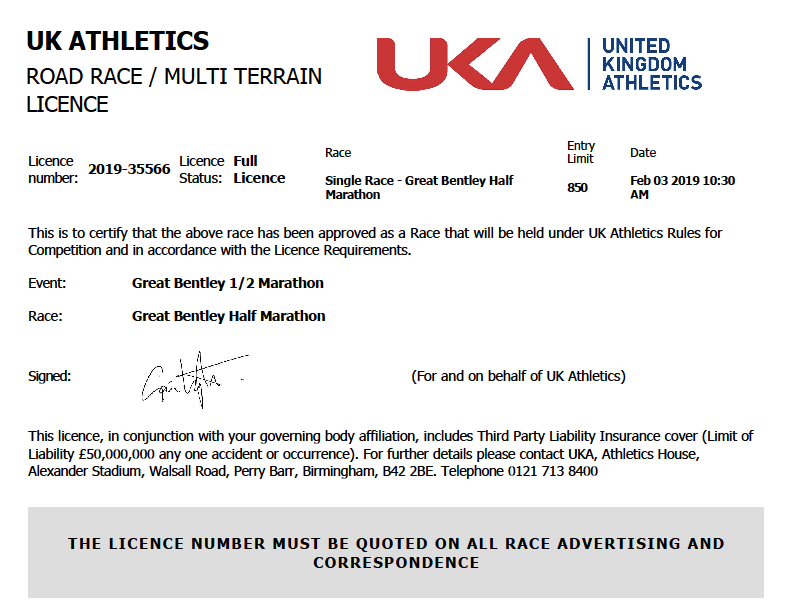 If the race is cancelled for any reason which is deemed not to be the fault of Great Bentley Running Club it will not be possible to defer entry nor will any entry costs be refunded. Read our race report for the 2016 race.